Matthew Apgar - mapgar@shawmedia.com Huntley's Travis Walsh, left, and Jason Zobott, right, sandwich Jacob's Kurtis Preis as they all vie for the header during their boys soccer game on Thursday, Sep 24, 2015 at Huntley High School in Huntley. Matthew Apgar - mapgar@shawmedia.com Huntley goalie Michael Parks watches as teammate Travis Walsh, left, collides with Jacobs' Nicholas Voss during their boys soccer game on Thursday, Sep 24, 2015 at Huntley High School in Huntley. Matthew Apgar - mapgar@shawmedia.com Huntley's Michael Zembrzuski, left, and Noah Melick of Jacobs battle for the ball during their boys soccer game on Thursday, Sep 24, 2015 at Huntley High School in Huntley. Matthew Apgar - mapgar@shawmedia.com Colin Walsh of Jacobs, left, clears the ball away from a charging Travis Walsh of Huntley, right, during their boys soccer game on Thursday, Sep 24, 2015 at Huntley High School in Huntley. 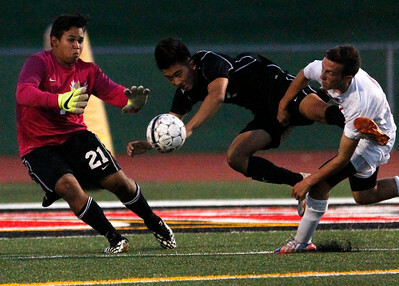 Matthew Apgar - mapgar@shawmedia.com Jacobs goalie Eduardo Guimaray, left, and Daniel Kim, center, successfully stop a shot on goal by Huntley's Andrew Meyer, right, during their boys soccer game on Thursday, Sep 24, 2015 at Huntley High School in Huntley. 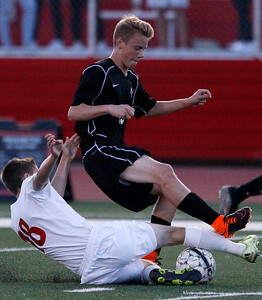 Matthew Apgar - mapgar@shawmedia.com Aaron Ruffner of Huntley slides into Jacobs' Daniel Buirge during their boys soccer game on Thursday, Sep 24, 2015 at Huntley High School in Huntley. 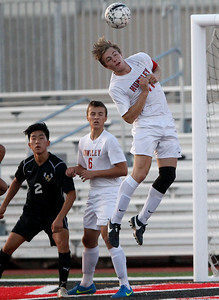 Matthew Apgar - mapgar@shawmedia.com Huntley's Kyle Carberry goes up for the header against Jacobs during their boys soccer game on Thursday, Sep 24, 2015 at Huntley High School in Huntley. 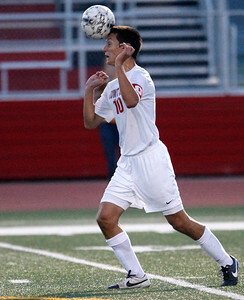 Matthew Apgar - mapgar@shawmedia.com Huntley's Allesandro Vergara connects with a header during their boys soccer game against Jacobs on Thursday, Sep 24, 2015 at Huntley High School in Huntley. 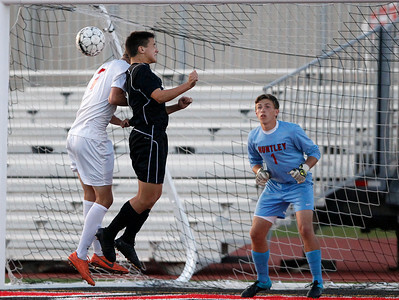 Matthew Apgar - mapgar@shawmedia.com Huntley's Michael Zembrzuski connects with a header against Jacobs during their boys soccer game on Thursday, Sep 24, 2015 at Huntley High School in Huntley. 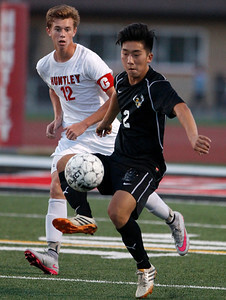 Matthew Apgar - mapgar@shawmedia.com Daniel Kim of Jacobs traps the ball to gain control of it in front of Huntley's Jason Zobott during their boys soccer game on Thursday, Sep 24, 2015 at Huntley High School in Huntley. Huntley goalie Michael Parks watches as teammate Travis Walsh, left, collides with Jacobs' Nicholas Voss during their boys soccer game on Thursday, Sep 24, 2015 at Huntley High School in Huntley.